I would not recommend short-barreled .454 Casull, because of the extreme noise it causes when fired. I coworker of mine had a Ruger revolver in .454 Casull, and it was a hand full, plus incredibly noisy. Years ago, some of the A-10 Pilots in Alaska had a survival package that included a short-barreled .454 Casull. The idea was for the pilot to defend himself (or herself) from bears after a crash until rescued. My advice, if buying a .454 Casull, would be to buy one that has a barrel not shorter than 5" or 6". The .454 Casull is quite popular in Alaska, and those of us who carry such in the outdoors load them with ammo that have a little over 300-grain hard cast bullets. These are readily available in most gun stores. Also, have it Magna-Ported to aid with muzzle jump. Some of the .454 Casull loads are quite similar to the loads for the .45-70 rifle. I had a toklat. 5 or 5.5" barrel. I shot it with 395 grain corbons. Thang was a beast. I traded it after 12 rounds for a 2 1/2" barrel 629 in 44 mag. I like the Freedom Arms .454 Casull with a 7-1/2" Magna-Ported barrel. It's a heavy gun, but the weight and the ports help with recoil. Have to agree with the 45/70 Marlin Guide Gun and 44mag Ruger Black/Redhawk combo. Pretty much the standard in backcountry setup. Truly. Would one need something that hit harder than modern loaded 45/70 backed up by a Casull? The latter basically being a 45 Colt Magnum. I wouldn't feel under gunned, even in an African setting,armed thus. I've played about, trimming Cassl brass to Colt length, for power loads in my Blackhawk and 94 Marlin. Brass life being my goal. .my main power load for around here being 19/20 gr of 296 with a CCI 350 primer, The 250 and 300 gr Hornady XTP topping off. The 300 gr took a nice Muley, with a neck shot, at a bit over 200 yards, dropping him like a hot rock, flat in his tracks. And that was a hot Colt, not a Casull. The asull has reached new life Intl the Colt for us fans of the old girl. I don't have a Casull, yet, but I see one in my future. With the thicker case wall of the Casull brass, I've kept my loadings at the 19 gr mark, figuring the thicker wall would possiy increase pressures higher than standard Colt brass.All I can say is it works, with no over pressure signs, SK I've felt no need to go hotter. Especially with the results I've seen. I absolutely love the 454 Casull. Compared to my 500, it's a tame gun. 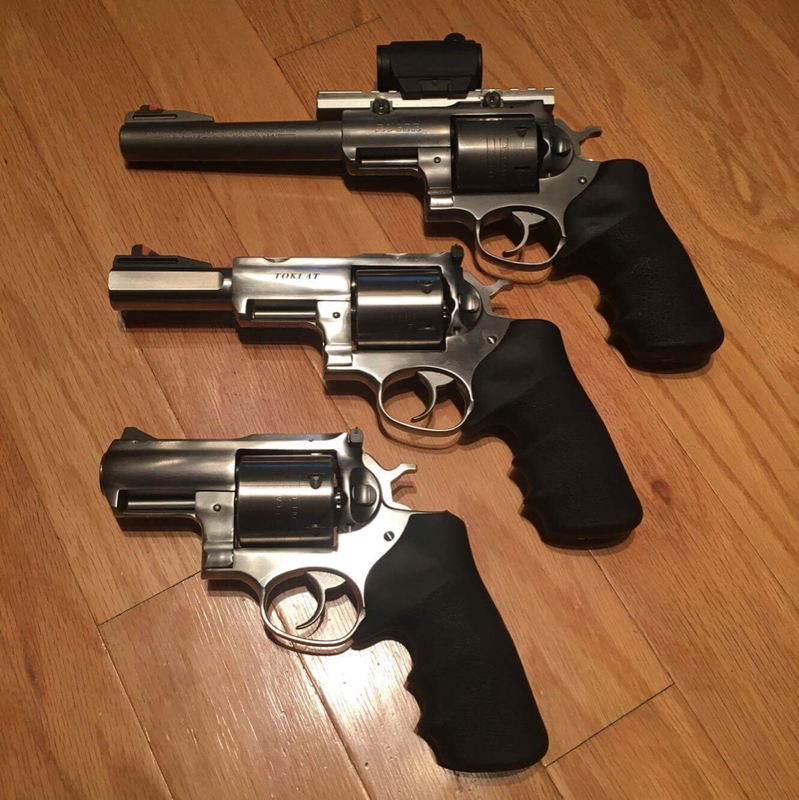 I have the 454 in 3 varieties. Recoil beteeen the 7.5" and 5" is not much difference. The 2.5" is stout but not unpleasant. In fact, I have shot 357 Magnum Snubbies with more pain than this. The weight and girth of the Alaskan makes it a controllable revolver. When I first shot it, I had a difficult time controlling it. I have shot it 45 times, first outing. 50 or so second outing. It is a lot better each time I go out with it. I have some bear load 454 Casull 340 grain bullets to try out. The Alaskan and Toklat were not zeroed from the factory for standard hunting loads. It was 8" low at 15 and 25 yards. I have a Bandolier Holster for the 7.5" and I have a Grovtec chest Holster for any of the three revolvers. Against bear, the most important thing is load. As I may have quoted an article, the 4-3-1 rule should apply: 4x Magnu, 300+ grains, 1xxx FPS. These are my backup carry guns for hunting and hiking.